two peas & the dog: garden. 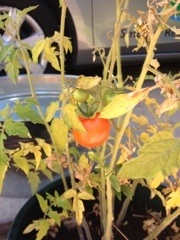 we have a tomato. garden. we have a tomato. Yep, one cherry tomato. Not sure what's going on with the rest of them. This one is destined for my tummy. Tips on growing tomatoes in Australia? Send them my way! Oh, don't mind the yellow leaves on the plant. I promise I've cleaned them up. me: a seattle transplant in south australia. happily married, mom of @DukeInAustralia, food + wine loving, wanna be blogger.